Here's a video from today. The clouds after 1 PM are fun to watch. You can see Venus in the last few frames. Question -- I noticed that the elapsed time clock was scrolling through one-minute intervals, and not the normal 10-minute intervals that the webcam uses. How did you get pics every minute to use in this awesome compilation video? The webcam computer/camera setup takes a picture every minute. But only uploades every fifth picture to the internet. For every 1-minute picture taken, it creates a smaller-sized image for the video, and stores it in a folder on the computer. At the end of the day, the SebecTec software automatically makes a video from those. It took me quite a while to create a DOS script to keep track of which picture in the sequence was being processed. I'd really like to take a picture every 15 or 20 seconds and try making a video from that. Even the one-minute video is jumpy with the moving clouds. If anyone is interested, here's the 11 MB .avi video file of the above video. Due to its size, I'm not sure how long I'll leave it on the website. I have just learned the computer driving the Whitney webcam seems to be having trouble connecting to the Internet. Russ at the museum will try working on it more this afternoon. We are missing views of the current storm. I was off-line for several days, so I called Russ at the museum. He had checked the line to the router and modem, and all checked out ok. So he pulled the computer out of its hiding place in the base of the tower, and opened up the case. Inside the case, a mouse had taken up residence, gaining access through an uncovered expansion slot. The nest was built right on top of the cooling fan and communications card, and there was a lot of mouse droppings inside, too. Russ took on the unfortunate task of cleaning up the mess, and upon reassembling it all, the webcam is back on line! Oh, and the expansion slot is now sealed with aluminum tape. ...and now a power failure on Friday stopped the Williamson webcam. The camera needs it's power button pressed to bring it back on-line -- an easy task once you open up the box it is in. So, our webcam computer housing a mouse ... is that what you call a mouse pad??? The Museum needs a CaT? 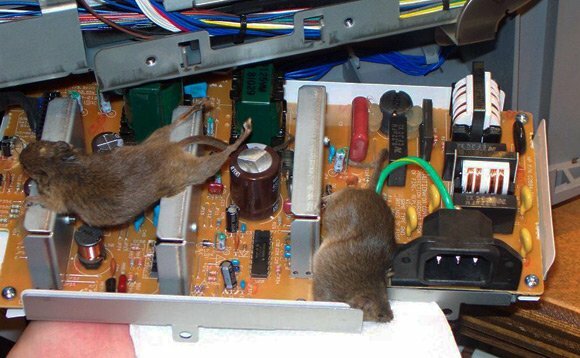 Wouldn't it be correct to say "mice", looks like two of them. They're darling. Has anyone named them yet? How about "Positive" and "Negative"? Positive and Negative.....I like the names. Looks to me like 2 candidates for either the Barn Owl cam or the Eagle cam & I know PETA will be after me for that, plus a few on this site. Actually, they have a distinguished scientific background. Both occupied the Applied Electricity Chair at a major University. OMG!! I am laughing so hard!!! I was thinking of something in a slightly darker vein, but, I love it!! Also, CaT would be happy to comply with mouse removal duty -- just move him to California! Nah, Momma birds don't go for cooked food. They are from the same family, so they have the same surname, that being "Terminal". This morning the Whitney cam was down for an hour or so. Steve was informed, and the Museum staff woke up the mouse or something, so it's back up again. If you notice a problem, just email SteveC. He works, he doesn't watch the board every minute, so don't be shy. A lot goes on behind the scenes to make this a humming board. Generated in 0.019 seconds in which 0.008 seconds were spent on a total of 14 queries. Zlib compression disabled.